This book is hot! It takes all the guesswork out of federal gun law, explaining clearly how the whole thing works. Covers the hard-to-find "proper authorities" laws, the Militia, the National Guard, citizens, dealers, importers, collectors, global disarmament, explosives, laws that can take your rights away and the laws to restore them too  great laws, bad laws, 70 pages of juicy intro material, the Lost National Right to Carry... without a doubt this is the fundamental firearm reference book. Don't be fooled by the partial set that BATFE issues. They leave out the parts that control them, and only provide some of the parts that affect you. Unabridged  all 271 federal gun laws are included, plus thousands of words of "Statutes-at-Large," the unnumbered "hidden" gun laws. And every law is described in detail, in plain English. America's gun laws are better than you might think  they protect and regulate the right of the people to keep and bear arms for all lawful purposes, severely punish criminal activity, and delineate the government's role. The gun laws are such a mystery, basically, because very few people have ever seen them all. It's like a firearms-law library at your fingertips. The plain-English parts make everything so easy. It's actually fun to readbrowse it and you'll see! "Replaces the black hole of ignorance with the bright white light of knowledge." 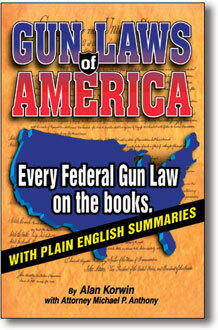 Alan Korwin and Michael P. Anthony are the authors of Gun Laws of America. SAMPLE ENTRY FROM "Gun Laws of America"
The Gist: Any rifle range built at least partially by federal money may be used by the military and the public. Regulations for use are written by whoever controls the range, fees may be charged, and the military has first call on use of the range. This is one of the few sections to survive the 1996 repeals of the Civilian Marksmanship provisions. The repealed sections have been changed somewhat and are now under Title 36 of the U.S. Code. (a) Ranges available.All rifle ranges constructed in whole or in part with funds provided by the United States may be used by members of the armed forces and by persons capable of bearing arms. (1) In the case of a rifle range referred to in subsection (a) that is located on a military installation, the Secretary concerned may establish reasonable fees for the use by civilians of that rifle range to cover the material and supply costs incurred by the armed forces to make that rifle range available to civilians. (2) Fees collected pursuant to paragraph (1) in connection with the use of a rifle range shall be credited to the appropriation available for the operation and maintenance of that rifle range and shall be available for the operation and maintenance of that rifle range. (3) Use of a rifle range referred to in paragraph (1) by civilians may not interfere with the use of the range by members of the armed forces. (c) Regulations.Regulations to carry out this section with respect to a rifle range shall be prescribed, subject to the approval of the Secretary concerned, by the authorities controlling the rifle range. 22 Complete chart of the growth in Federal Gun Laws. 26 State Laws and the lost National Right to Carry. 30 Just how many groups are exempt from firearms laws? Here's the complete federal list with cross-references. 34 One of the surprising conclusions from all the research: The gun laws are generally excellent. 57 The legal numbering system is designed to bamboozle! Demystify the whole thing in a few light-hearted pages. Find out what "§" is and how to write one. 61 The entire hierarchical structure of federal law in a chart, from the Constitution to subparagraph (A)(i)(I). 88 So what exactly is the Militia? It's described by law -- and it's definitely not private musters of rural citizens. 153 One law -- the Lautenberg amendment -- conflicts with eight Constitutional guarantees. 202 Posse Comitatus. It's in the headlines -- should the Army enforce civilian law? See what the law says. 213 Feds can wiretap for gun crimes -- plus 2-1/2 pages of other things right down to criminal mischief -- and they want more. See if you think they could use more. 235 It may come as a surprise, but, world peace and global disarmament is the official policy of the United States. 272 Isn't the Militia the National Guard? See what the National Guard actually is and decide for yourself. 279 Official federal policy is to teach firearms safety to youngsters and adults. 289 The worst English syntax on the books (my opinion). 312 Arm the pilots: It's actually deputize the pilots, and arm the deputies. 326 How will caliber bans affect the general public? in the work we do. Alan Korwin.